Istanbul Dried Fruits and Products Exporters' Association was founded in 1951 and has around 140 members. It represents companies which export about all kinds of dried fruits, nuts and processed form of these products. With respect to production and export shares of dried fruits and nuts Turkey is one of the most important countries in the world. Turkey exports dried fruits, nuts and the various processed forms of them to more than 100 countries all over the world. The European Union, the Russian Federation, the USA, and the Middle East countries are the main destinations for Turkish dried fruits and nuts export. 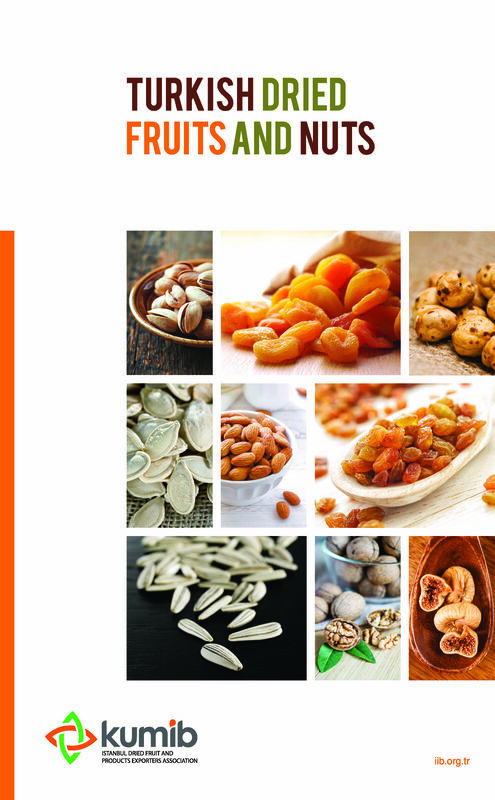 Field of Activity consists of seedless raisins (sultanas), almonds, walnuts, Antep pistachios, roasted chickpeas, pine nuts, prunes, roasted sunflower seeds and pumpkin seeds; dried apricots, figs, peaches mulberries, as well as processed forms and mixtures of other dried fruits and nuts (except hazelnuts). Operating within the sector, Dried Fruit Promotion Committee (http://www.dfpc.org.tr ) runs promotion activities.